Browse through our most popular designs below and find the one that best suits your needs. We can customize the color schemes to match any branch of service... Army, Navy, Air Force, USMC and the Coast Guard. We have you covered! Our newest offering is the addition of our rank shaped shadow boxes, which are handcrafted from solid wood. All of our displays are 100% hand-made right here in the United States, using only the highest quality materials. Every purchase is made-to-order. If you are looking for a military frame that is unique from all the rest, then you have ABSOLUTELY found the right place. You are NOT LIMITED to the layouts you see below. We are fully capable of designing a custom display frame from scratch. Click Here To Start Your Free Sample Display!!! Need some proof that we know what we're doing? View Our Updated Portfolio Here! Contact us with any questions you may have and our design specialists will help! Note: Items ARE NOT included in Pricing. What Makes Our Military Display Cases Different From The Rest? When most people think of a shadow box layout, they quite often think of a deep set frame that has an item or group of items displayed on a backboard, and then covered with a lite of glass. Although this style of box is quite nice, we here at Military Memories And More take a different approach with our designs. We add the effect of using customized mat board cutouts to separate the items in the layout, giving it more of a unique and sophisticated look. The mat board placed on top can be designed with a personal touch. For example, you could V-groove or scribe (ink) your name, unit or branch of military service at the top of the mat. You could also include things such as quotes, dates, motto etc. above or below any additional window openings. Adding the extra little touches to a design is what makes each display a true one-of-a-kind. 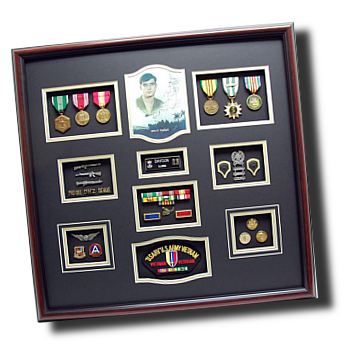 Military shadow boxes have been around for years, but now with the addition of modern technology and our computerized mat cutter (CMC), we bring new life to any display case along with precision accuracy. We can handle even the toughest of challenges that are brought our way, and welcome you to challenge our custom framing expertise with your creative ideas. If you can name it, we can surely frame it. We are here to take care of you and show our appreciation for the service you or your family members have given to this great country.